I usually go running along the same route every time, which takes me past the local tae-kwon-do studio on Las Tunas. If it is a Monday or a Friday, out of habit I think back to the previous Monday or Friday that I ran past the studio and it always strikes me how quickly the week has gone past and now it is another Monday or Friday. And everything looks the same. I wonder if the people who see me go past recognize me. Most of the parents inside watching their kids are Asians and they all look alike to me, haha..
Like clockwork, I'm at Costco every Saturday morning. This time it was slightly different as I stopped at Kaiser first for them to stick a needle in me for blood samples, and then I headed to Costco and arrived about 15-20 minutes before the store opened. Since it was already so hot, I got a cart and sat down in the food court area to wait for them to slide up the metal doors and let the hordes in. Already, it looked like the beginning of a NASCAR event. Three shoppers were lined up in the front, parallel with one another, literally about six inches away from the door. The rest of the pack was assembled behind them, gunning their feet, ready to yabba-dabba-do inside as soon as door was lifted high enough. What is the rush? It's not as if Costco is going to run out of anything. 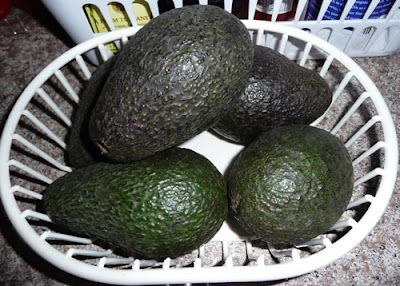 The avocados are starting to look pretty good so I got a bag of 5 large ones. 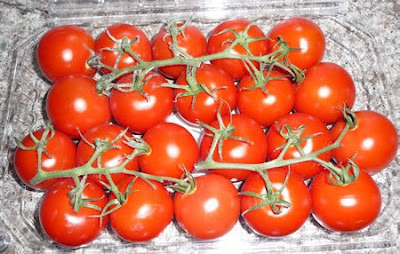 These Campari tomatoes are the best store-bought tomatoes I've tried; they actually taste like tomatoes and not like mushed cardboard. They're on the expensive side ($4.49 for two pounds) but still cheaper than those "vine ripened" tasteless globes the grocery stores pawn off as tomatoes. 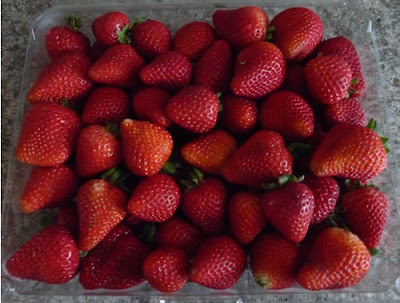 Mmm, these strawberries are really sweet. And much cheaper than at the grocery stores. This is a 4 lb. package but they go very quickly. Thing is, I kept lifting boxes to find just the right package (so I got my exercise lifting 8 lb. weights today). I thought the prime strawberry season had passed, but these were better than the ones I got back in May and June. Maybe they were ripening up in cold storage all this time. 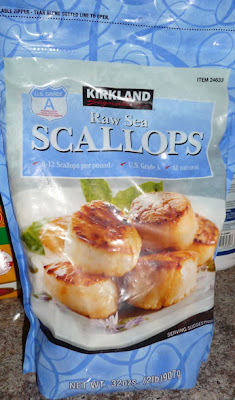 Costco sells some wonderful frozen scallops. Since most of the scallops you buy are frozen and then defrosted, it's better just to buy them frozen in the first place so you can defrost them at your leisure, not at the store's whim. And these are really big, too. We usually can eat just 2 or 3 and are filled up. 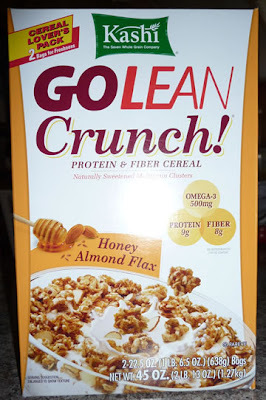 If you want to break your teeth, get this cereal. It is ultra crunchy so you have to eat it carefully, but I like the way it tastes. 45 ounces for $7.99. For a while Wal Mart was selling 15 ounce boxes of this for $2.00 each under some promo and I bought a bunch of them, but now they've raised it up to $3.49 each so Costco is the much better deal. While I was sitting outside waiting for the store to open, this was one of the new arrivals posted on the wall and that's what made me go look at it. 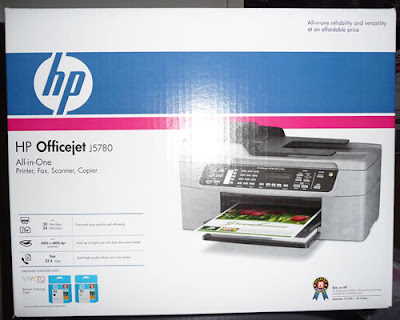 Julie has been needing a new printer since her old one pulls about 3 or 4 sheets through at one time, and a new fax machine since her old one only works part of the time, a copier since we use a scanner to copy things but it is slow. So this fit the bill - a copier, fax, scanner and printer all-in-one for $89.99. The exact same thing is $149.99 on Amazon.com. Just don't tell my boss I bought this since we sell the same sort of stuff at work (except it is a lot more expensive, but then it's made for heavier business use). 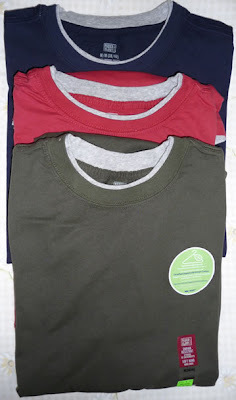 And, we went to WalMart today and I wound up with these cheap t-shirts, $5 apiece. As you can see I am very imaginative when it comes to clothes. As is my custom, I will buy several of the same style in different colors and then wear them to death. Changing the subject, I received a nice e-mail from someone who told me that my recollection of them (very positive) didn't match their own perception of themselves (not so positive). And they went on to say that had we known what others really thought of us, it would have made for quite a different childhood experience. On that same note but with a different person, way back in Dorsey days I had asked Carol to go with me to a Chicago concert. We doubled with my buddy Duane, who took Lorraine. Many, many years later I had mentioned to one of Carol's friends that I had always thought she was very good looking. She in turn mentioned this to Carol who responded something like, she wished she had known how I felt back then because it would have really raised her self-esteem. Back in those days (and even now) it wouldn't have occurred to me that Carol felt that way. I always assumed I was the only one! Did we all have those self-doubts and possess less than ideal self images? I had just assumed that these people saw themselves the same way I did. Maybe it's like photographs or recordings of ourselves. We hear a recording and don't think it sounds like our voice, or see a picture and don't think it looks like the same person we see in the mirror. Yet, everyone else will tell you yes, that's what you sound like or look like. They just assume that we would have the same perception. Back to Carol and the Chicago concert: from that entire evening the only thing I remember is the four of us sitting in the Forum long after everyone had filed out and we were one of the few, if only people remaining. That was the only time I ever went out with her and I really don't know why it stopped there except I suspect it was because of that terrible shyness I had. I always assumed everything was an uphill battle asking anyone out and considered it a major victory if the girl said yes. I recently discovered Carol had looked upon the concert as a group outing rather than a date. I thought that was kind of odd because to me, four people isn't a group outing but more like a double date. So perhaps for that reason she didn't wonder why I never asked her out again. My not asking certainly had nothing to do with her, or that evening, even though I can't remember anything except sitting in an empty Forum (did something happen that was so traumatic I have amnesia? naw..). And the recollection that Misa, Carol's friend, has of me didn't match up to my own self-perception, either. Anyway, the point of this latter half of this blog entry is to say it's interesting comparing what we thought of ourselves to how others saw us. And like was pointed out in the e-mail, what a difference it might have made as we were growing up to know that. But, it is awfully hard to let down your guard. Look how long it took me to start this blog!